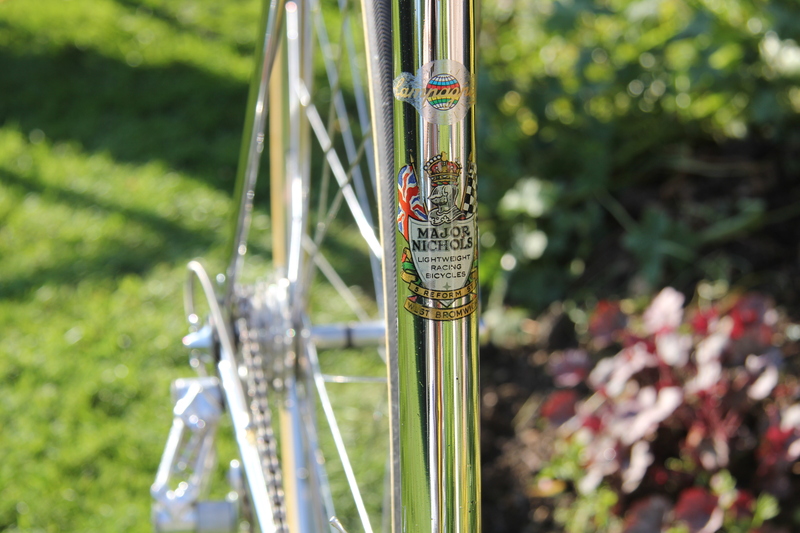 I have had difficulty classifying this uniquely finished and stunning Major Nichols frame initially. On one hand fairly close tolerances for the period then forks with fine strongly curved blades looking back to the late 50’s and earlier times. 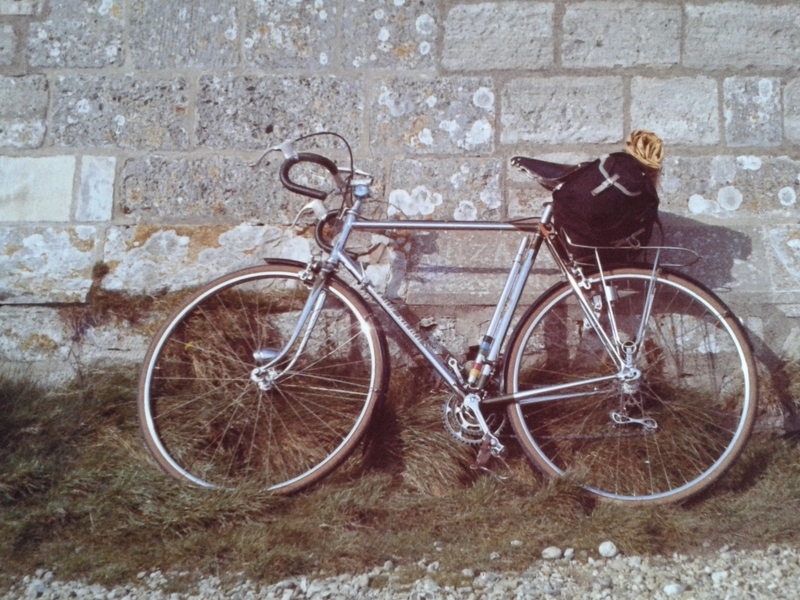 Three things clinched it for me despite the fact Philip, who has owned her since 1970, equipped and used her as a tourer. 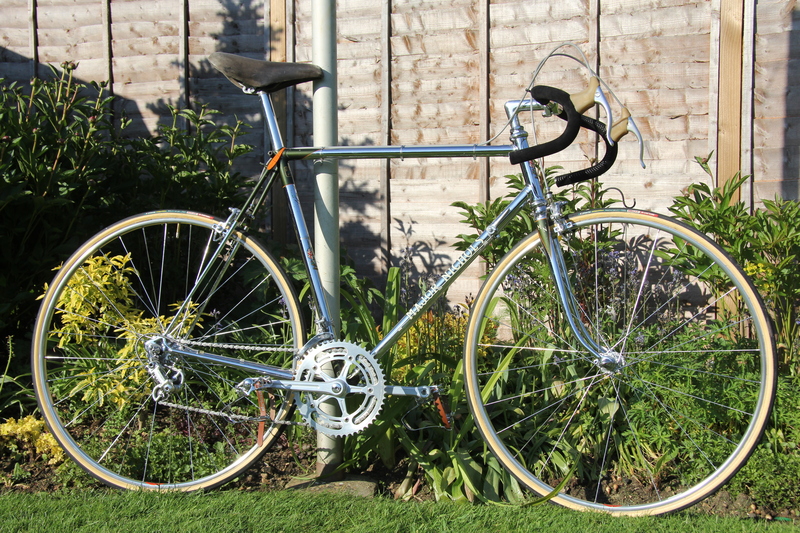 Firstly the lack of width for the 27” HP tyres suggesting a build for 700c/sprints, secondly the full sloping fork crown and finally the clincher; no lamp brackets and minimal braze-ons. 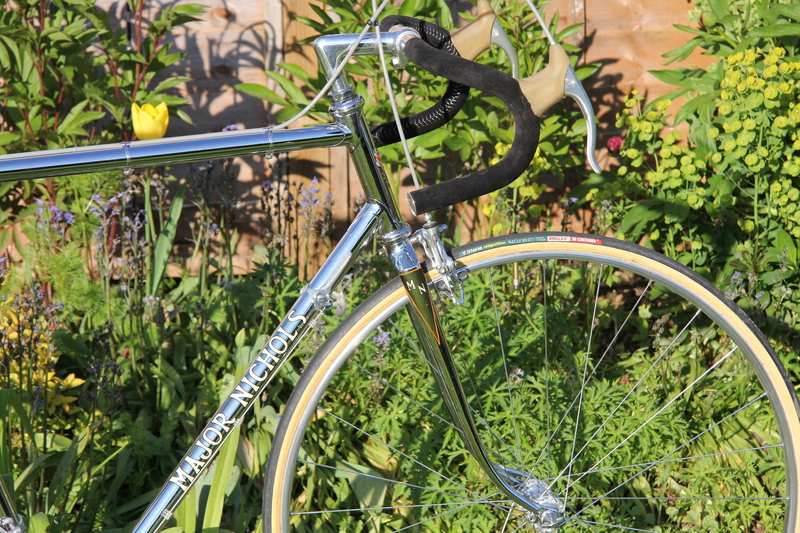 Reynolds 531 double butted tubing on Prugnat S lugs. Assembled in an example of the best quality preparation and frame building practice showboating the art and skills of a great builder to produce a unique masterpiece. Look in particular at the work on the Allen key top lug seat cluster behind the wrapover. There are only braze-ons for front and rear derailleur stops and rear guides and dropout mudguard eyes. 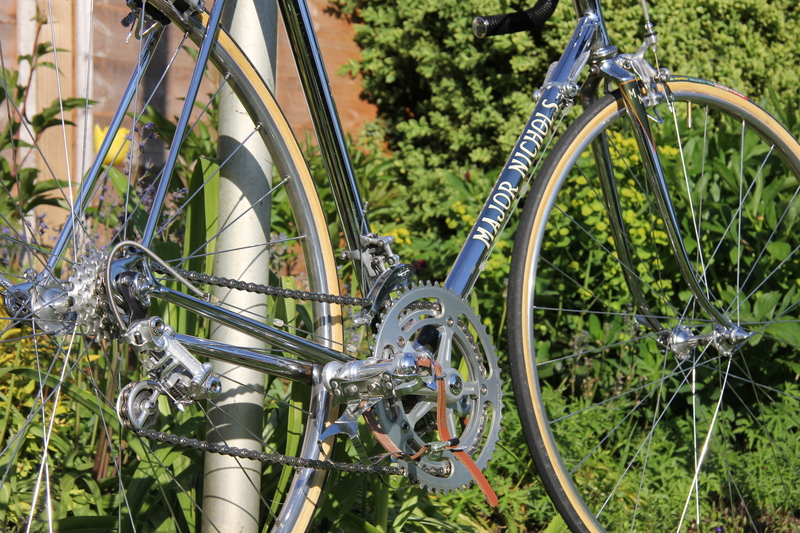 The fork crown is a fully sloping fork crown, probably a Cinelli Integrale finishing the picture with the early style fork blades. The fully chromed frame has been finished with the elegant mid green flam finish, referred to in our family as the ‘Nardy Green’ much loved by my youngest daughter. The small sprayed sections are outlined in a chrome yellow. Those on the forks are an elongated spearpoint which contains black M and N transfers in a unique combination to us in a standard seraph script. 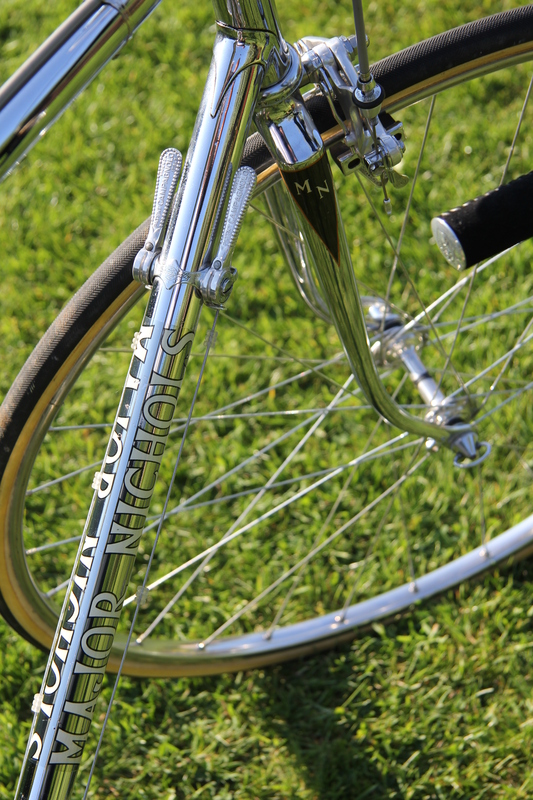 White back edged Gothic script name transfers on downtube, Reform Street shield and flags transfers on head and seat tubes with a Reynolds 531DB transfer and below it an agent’s transfer (Priory Cycles of Birmingham). The wrapover seatstay topeyes are in Chrome Yellow with the double fishtail motifs in black in a very fine brush with a couple of extra central lines. There has been talk of Winnie, his wife, decorating some frames and I wonder if this might be an example as it is so much more precise, fine and refined than his normal bold work. There is another example this kind of work. Philip tells us of many happy years touring before she was stored in his garage. He had used components from his previous bike to outfit her and these fulfilled his own needs. They appear in a good serviceable condition. We would love to know the name of the original owner of this gem.